I would like to share some exciting news about a new Paramount project. We have entered into an agreement with Sony Pictures Television to co-finance and co-produce a one hour pilot of “Beverly Hills Cop” for the CBS Television Network. If the pilot is picked up, we will continue to work with Sony TV on the series. As you know, “Beverly Hills Cop” is a highly successful Paramount film franchise which stars Eddie Murphy and was launched in 1984. This is the first television project to come from Paramount since the separation with CBS and will be a great opportunity for us to collaborate with our former colleagues. This pilot is also an example of being nimble and looking at our library with an eye toward capitalizing on an opportunity to make great content and create value by reviving a wonderful Paramount franchise. Written by Shawn Ryan, the pilot will be directed by Barry Sonnenfeld and will star Brandon T. Jackson, Sheila Vand, David Denman, Kevin Pollak and Christine Lahti. 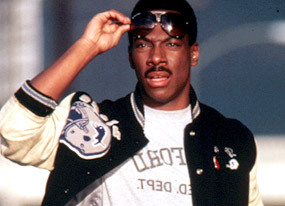 I’m very happy to say we expect Eddie Murphy to appear in a recurring guest star role as Axel Foley. The “Beverly Hills Cop” pilot will be a continuation of the film franchise and center on Foley’s son, who follows in his father’s footsteps and becomes a police officer in Beverly Hills. Whether it’s this pilot for CBS, our “Burning Love” series on Yahoo!, or “Star Trek Into Darkness” on the big screen, Paramount will continue to be flexible, innovative and smartly opportunistic. The wealth of talent we have at Paramount and the great creative partners we are lucky to work with make projects like this one possible. I want to thank everyone involved and I look forward to what’s ahead. Sylvester Stallone In Talks for a ‘Rambo’ TV Series!!! Brandon T. Jackson Set As The Star Of CBS’ ‘Beverly Hills Cop’ Reboot!!! This entry was posted on Monday, March 4th, 2013 at 8:44 pm	and is filed under Film, News, Television. You can follow any responses to this entry through the RSS 2.0 feed. You can skip to the end and leave a response. Pinging is currently not allowed. « ‘Walking Dead’ Season 3 Recap – Episode 12 ‘Clear’! !